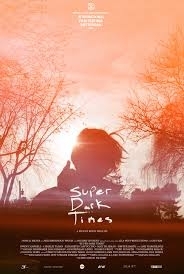 Super Dark Times played at the 2017 Tribeca Film Festival with the director and most of the cast in attendance at my screening. It is a dark feature that commits to its premise with considerable zeal. The development of the characters and the situation they face resonates and makes the viewer squirm in his/her seat as the story unfolds. Zach (Owen Campbell) and Josh (Charlie Tahan) are typical suburban high school students and best friends. All the normal rhythms of teen life are well-developed in the opening ten minutes and you genuinely come to like both boys as they discuss their mutual interest in a classmate, Allison (Elizabeth Cappuccino) in a funny scene involving a glue mishap and double entendre. A fringe friend Daryl (Max Talisman), provides early comic relief for this movie. He along with his friend Charlie (Sawyer Booth) round out a foursome that feels very much like Southpark in its makeup. Daryl is hilarious with his personality and delivery. At the post-screening Q&A, he demonstrated that this trait is a basic part of his character on and off the screen. The fun nature of the movie up to this point shifts after a chance accident involving a sword and a bag of weed leads to the death of one of the kids. The subsequent coverup by the remaining party and its aftermath is the focus from here on out. Though you could say we have seen this before, the way in which the violence is displayed onscreen is haunting in its realistic nature without glorifying the acts themselves. Though the movie has some slow points (the movie centers on a lot of wistfulness of one of the characters while the other is locked away for an extended period), the movie is a satisfying affair. One other thing to note, Kevin’s extensive credits in cinematography are quite clear. The many long shots of barren trees at night throughout the film, help to maintain the tone and set the slowly building tension in this dark tale.